It’s clear that the context of the global business process outsourcing (BPO) sector is changing rapidly. No longer simply the answer to the question of cutting costs, customer contact and shared service centers are now often – and rightly – seen as integral parts of a business. The ingredients of a successful BPO hub are changing too. For world-class businesses, cost is part of the equation, but alongside many other factors. Scotland has a long and proud tradition of excellence in the financial and business services sector. Today, with companies tapping our unbeatable combination of high-quality skills and competitive costs, the nation has become the ideal location and home to some of the largest contact centers in Europe. At the heart of Europe, within a short journey from the City of London, Scotland is able to serve a wide range of markets throughout the continent and from Central and South America to Asia Pacific, with the support of academic institutions, stable infrastructure, and advanced facilities. 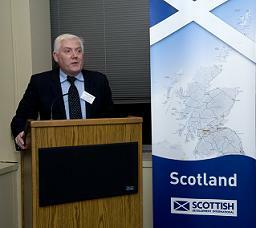 Its impressive record of success in the field has made Scotland an internationally recognized BPO location. But we are not resting on our laurels. In Scotland we’re taking a lead in ensuring what we have to offer meets the needs of the new business landscape. First, we continue to invest in one of the most impressive and skilled contact center workforces in the world. With a world-renowned educational system and a ratio of greater than 20 percent of working-age graduates working in the shared services sector, there are more than 86,000 people employed within 400 contact centers in Scotland, meaning that one in every 30 employees works in a contact center. Due to the wealth of multilingual capability available in Scotland, the BPO contact centers feature a mix of 26 different languages in a wide variety of operations in a diverse range of sectors including financial services, telecoms, utilities, retail, technical support, travel, and media. Second, this quality workforce is allied to an extremely cost-competitive environment. Labor market regulations in the UK, including working hours, are among the most flexible in Europe, and staffing costs are highly competitive. Scottish salary costs, including indirect social wage costs such as employer national insurance, are among the most competitive in Europe. And companies will find that high quality workspaces at very competitive rates are aplenty in Scotland. Within minutes of large population centers in Edinburgh and Glasgow, investments have been made to make world-class contact center space available at a fraction of the costs of similar space in other capitals throughout Europe. Finally, for call center personnel, Scotland has a well embedded training infrastructure developed by the public and private sector. Established in 1996, Customer Contact Association (CCA) is the professional body for the Call Center, Contact Center, and Customer Service Industry in the UK. Headquartered in Glasgow, Scotland, the CCA endorses training courses at three levels with a strict quality checking process at each level. Furthermore, most colleges in Scotland have particular strengths in developing flexible preemployment training courses geared to meet the specific needs of contact centers. A broad range of courses have been developed in conjunction with companies, colleges and local enterprise companies in Scotland. More than 42 colleges and 21 private training providers offer a variety of customer care courses, with five colleges offering specific Customer Contact Centre courses. In Dundee for example, the local college delivers courses which last up to 8 weeks, with a focus on customer care, telephone technique and IT skills all of which delivered within a call center environment within the college grounds. Demonstrated by the number of corporations who have already taken advantage of the nation’s innovative and highly educated workforce and wealth of expertise in this field, Scotland’s dynamic business environment is proving to be the ideal shared service center location. Due to its advanced and cost-effective IT and telecoms infrastructure, competitive property market and highly- qualified workforce, Scotland has been chosen by companies including IBM, Morgan Stanley, Dell, O2, Iron Mountain, Eaton, Shell and NCR, as the hub for their service center activities. In the current global economic climate, leading global companies are looking for a BPO partner that can deliver high quality service and cost-competitiveness. In Scotland, we’ve taken that challenge to heart, providing world-class contact center options to world-class firms. Danny Cusick (pictured here) is the President of the Americas for Scottish Development International the international division of Scottish Enterprise and joint venture with the Scottish Government. Danny is responsible for all of SDI international business activities in the Americas.